It wasn’t long ago that I wrote a focus ticker article on Apple (AAPL) that raised concerns that I had about its weighting in my portfolio and the potential for me to trim shares. Ultimately, I didn’t follow through (though it’s too bad because in hindsight, I would have timed that trade up pretty well). However, I decided that there wasn’t another company in the market that I would rather own (which is why AAPL is by far my largest holding in the first place), so selling any shares would just result in a downgrade of quality. 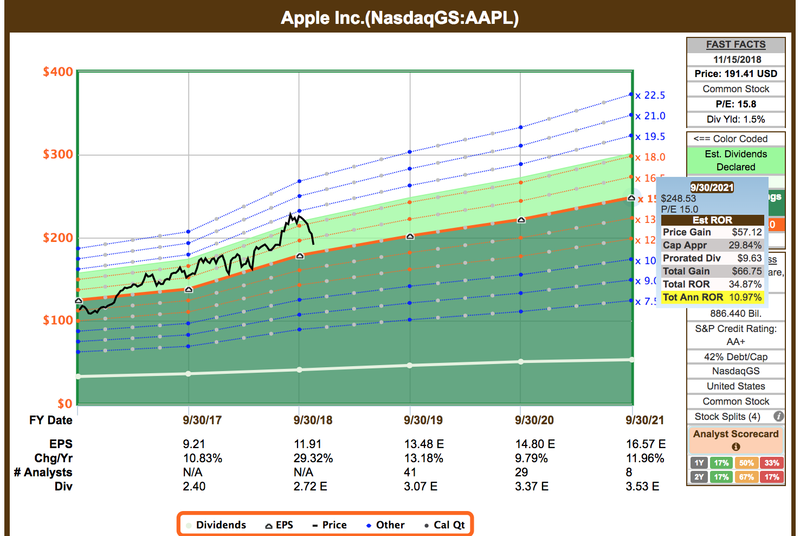 More recently, I penned a piece highlighting the potential for AAPL’s share price to rise above the $300/share mark in the next 12-18 months, in response to an analyst’s call. Obviously with that sort of short-term price target, I remain really bullish on shares. So, with that in mind, I put my asset allocation concerns and added to my AAPL position today as shares dipped more than 20% below their recent 52-week highs, buying shares at $186.50. The reason that my AAPL position has grown so large is because I’ve bought shares on just about every dip that the company has experienced since I began my investing career. I’ve said it time and again, AAPL shares are the easiest stock in the market for me to buy and own. These shares check all of the boxes that I’m looking for from both a fundamental perspective and a shareholder rewards one as well. 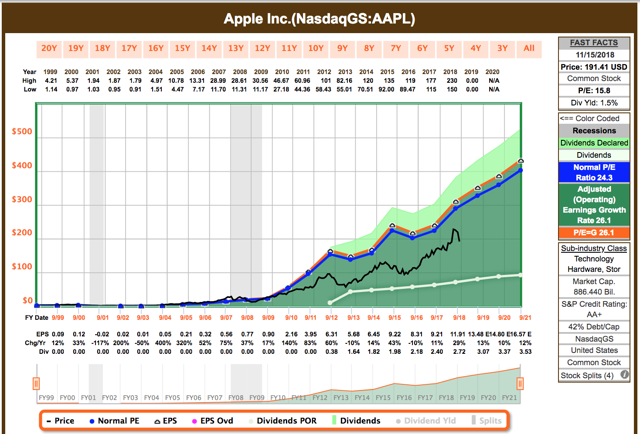 AAPL is the core building block on my long-term dividend growth portfolio. Even after recent weakness, I see no reason to change that sentiment. Speaking of dividend growth, that seems like the best place to start here. AAPL is not included in many DGI portfolios because it doesn’t have a very long annual dividend increase streak. The company didn’t begin paying its dividend until 2012; however, since then Apple management has rewarded shareholders with annual increases each and every year. Since initiating its dividend AAPL’s dividend growth CAGR is ~10%. Being that AAPL’s dividend payout ratio remains low at ~24% and the company is expected to continue to post double digit EPS growth into the foreseeable future, I expect for these double digit annual increases to continue. Simply put, if I had to pick one company to give me double digit dividend growth over the next decade or two, the pick would be AAPL. Assuming that the current ~10% annual increase rate is maintained over the long-term, the passive income that AAPL generates for me will double every 7 years or so. I know that some investors look at AAPL’s low, ~1.5% yield and like to place negative focus on that. However, I think it’s important to point out that the reason AAPL’s yield is currently so low is because of the stock’s recent price appreciation. This is a great problem to have. Furthermore, as a long-term investor, I think it’s probably more important to focus on the compounding potential of Apple’s dividend rather than its yield in the short-term. I’ve only been a shareholder of AAPL for 6 year or so, yet my yield on cost has already risen significantly. After my recent AAPL purchase, the cost basis of my overall position has risen to $106.79, meaning that my yield on cost is ~2.75%. At the current 10% annual increase rate, it won’t be long before that percentage rises significantly higher. This is the beauty of owning an equity that posts double digit dividend growth. But, as amazing as AAPL’s dividend growth potential is, it’s honestly dwarfed by the power of the other half of the shareholder return proposition: buybacks. For years, AAPL has been known for its enormous cash hoard. With so much of its cash locked up overseas due to unfavorable tax rates, AAPL’s wealth grew and grew to levels that the majority of countries on earth were envious of. And now that the tax rates have changed, AAPL management has mentioned that it would like to go cash neutral on the balance sheet, meaning that there are hundreds of billions of dollars that the company is looking to spend. AAPL will undoubtedly continue to investing billions into R&D. There is potential for large scale M&A as well, though historically, AAPL management has been hesitant to go with route, favoring organic innovation for growth. AAPL used some of its repatriated cash hoard to give investors a slightly largest dividend increase than normal in May, but it appears that the vast majority of those funds will be dedicated towards AAPL’s share buyback. Management authorized $100b+ for share buybacks earlier in the year and we’re beginning to see he power of this repurchase with management spending ~$73b on share repurchases during the trailing twelve months. I know that many investors wish that these billions were paid out in dividends, but looking out longer term, we really begin to see the power of AAPL’s share buyback. Since 2013, AAPL has reduced its outstanding share count by 22.7%. This plays a large role in the company’s strong EPS growth, which in hand, lowers the payout ratio and makes long-term dividend growth more sustainable. Here’s how I look at it. Since 2013, AAPL has retired ~1.4b shares. Right now, AAPL’s quarterly dividend payment is $0.73/share. This means that AAPL’s buyback program is saving the company $1b+ per quarter in dividend related expenses. This cost savings figure will only continue to grow as more and more shares are retired and the quarterly dividend in continued to be increased. I think that AAPL management can realistically retire 5-8% of the company’s outstanding share count over the next year or so. A lot of the recent pullback has been centered around fears of a sales slowdown. Well, even if that were to the case and AAPL only posted moderate revenue growth and margins stayed flat (which is unlikely due to the fact that ASP’s and high margin service revenues are rising) AAPL will post strong bottom line gains because of the reduced share count. Supply and demand is on my side as a long-term shareholder with AAPL reducing its float. What’s more, Warren Buffett and Berkshire Hathaway (NYSE:BRK.A)(BRK.B) continue to increase their position and I can only assume that they’re planning on AAPL being a long-term stake for them. Between the buyback and Berkshire, I suspect that a large percentage of AAPL’s shares are going to be removed from the market which should help to put a floor under the stock in the short-term. But even if Buffett wasn’t bullish on the name, I would still consider the recent sell-off to be irrational. I understand that the market doesn’t like question markets. Apple removing the hardware unit data from its future reports is probably a concern to certain analysts who try to make short-term projections, but to me, it doesn’t matter much. Actually, I agree with Apple CEO, Tim Cook, and his belief that the company is valued too low because of the market’s focus on hardware and if removing the unit sales data shifts that focus to the fundamentals (like rising sales, margins, earnings, etc) then I think it will be a great thing for the stock. I know that some analysts and investors alike see the data reporting change as a dubious means to hide demand issues, but I simply don’t see it. Apple remains the leading brand globally in the smart phone space. Apple’s brand is aspirational and synonymous with success across the world. If I had an Apple share for every time that I’ve heard someone talk about the death of the smart phone/iPhone, then I’d be a millionaire many times over. Sure, peak smart phone may be on the horizon. Maybe hardware refresh cycles will continue to grow longer as it becomes harder for companies like Apple to make meaningful innovations in the hardware space. Either way, the service revenue streams will likely continue to grow alongside the global active user base. Shares are irrationally cheap at this point even if the company’s sales are flat (or slightly negative). Sure, if iPhone sales fall off of a cliff, then an AAPL sell-off is justified, but I see no catalyst for this to happen. My point is this: Apple doesn’t need to continue to post double digit iPhone growth to be a great investment. Why? Because the company’s share are cheap, valued at ~14x 2019 EPS expectations. This means that the most profitable company on earth is valued with a premium below the broader market’s. With this in mind, i’s no wonder that Apple is willing to spend so much money on a buyback. Any shift in sentiment should result in multiple expansion. I think a 17x multiple is fair for a company with Apple’s fundamentals. If this were to happen, we’d be looking at gains of nearly 20% from here based upon 2019 EPS expectations. And, as previously discussed, I think those EPS estimates are low and will end up being well above the current $13.50 average. I think it’s feasible for AAPL to earn $15 or so in 2019, meaning that shares could easily rise to a $250/share price or more in the next 12 months or so and still be priced fairly. As you can see on the F.A.S.T. Graph above, even if shares continue to trade in this sub-market 15x range, investors are likely to experience double digit long-term total returns. Only time will tell. But, in the meantime, I’m content to accumulate shares alongside Buffett and collect this rising dividend.